One of the interesting things about living in Bavaria, a traditional Catholic region of Germany, is that we have a handful of state-recognized religious holidays. So today, for example, the libraries and university and stores are all closed in honour of Mariä Himmelfahrt -- the Assumption of Mary. Traditions about the end of Mary's earthly sojourn are of course important for the Catholic and Orthodox faithful, but they're also fascinating to those of us who study the history of religion. 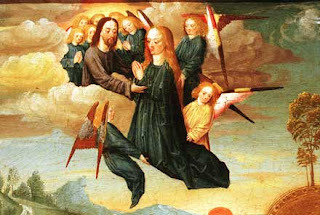 A resource to check out, if you're interested in digging a little deeper into the Assumption or Dormition of Mary, is Stephen J. Shoemaker's Ancient Traditions of the Virgin Mary's Dormition and Assumption (Oxford: Oxford University Press, 2002). Shoemaker discusses the earliest traditions and provides translations of some of the earliest texts. The BMCR review from Adam H. Becker. The author's website and Academia.edu site. On a side note, this is another example of why Ge'ez and other eastern Christian languages are so important to scholarship on Judaism and Christianity in antiquity, as many of the texts dealing with the Dormition and Assumption of Mary are in these languages. True publish.The facts you've got shared right here may be very beneficial for me.custom essay writing service i will percentage this information with my friends.thanks a lot for sharing this put up.